We focus our commercial HVAC expertise in the office, faith, healthcare, industrial and educational markets. Syncquip Mechanical Groups provides custom HVAC maintenance solutions for a distinguished clientele within many of Omaha Metro’s prestigious buildings and institutions. Our Sync365 HVAC Maintenance programs are a new tailored approach to maintenance for clients who want real comfort and efficiency with minimized operational disruption. Our goal is to ensure efficient and continued operations of all your HVAC systems, including server room air conditioners, for the ongoing comfort for your tenants and uninterrupted operation of mission critical systems. Our hands-on approach allows us to be easily accessible when you need us most and ensures your peace of mind. Security is an important facilities concern. Syncquip Mechanical Group only employs OneSource certified staff ensuring your safety. Whether you are a medical practice, daycare, school or commercial office client, rest assured you are in safe hands. Syncquip Mechanical Group provides you with a dedicated account manager and team of technicians who will develop an intimate understanding of your system and provide you with the personalized technical support and information you require. We conduct inspections to enhance and improve our valued clients comfort experience. In addition to our regular maintenance inspections, we review sites annually from a different viewpoint to ensure that we are providing the best possible service both today and tomorrow. To allow you to be as hands-on as we are, we provide you with access to a secure web-based logging system to track your HVAC service and maintenance history, making it easy for you to generate reports when needed. Whenever you need an immediate resolution to a problem, a Syncquip Mechanical Group owner is available 24/7 to help you. You can be assured you are not just a client number of a multi location regional or national company. We are here to create comfort, efficiency & value for you. We understand the difficulty of changing maintenance vendors. During this process, our team familiarizes themselves with your facility’s entire HVAC system. This ensures consistent, cost-effective service at every point of contact thereafter while integrating your site into our Service Division. With your Sync365 maintenance agreement, you are automatically eligible for a 10% discount on all service orders. If your equipment needs repair work, you’ll pay less than standard rates. With your Sync365 maintenance agreement, we never put you on our waiting list. Instead, you’ll skip the line and become our immediate priority. Above all, none of us like when things break down. It means a frantic rush and some costly down-time. Plus, reactive maintenance is the most costly way to maintain HVAC systems. That means you can save your operating dollars for something more meaningful. Use at least 15 to 20% less energy than without preventive maintenance. Save money on reactive maintenance or avoid it altogether. Focus. You don’t need to worry about indoor comfort when everything is running well. Interesting fact: HVAC accounts for over 40% of a typical building’s energy use. Then that will rise as the system deteriorates without maintenance. 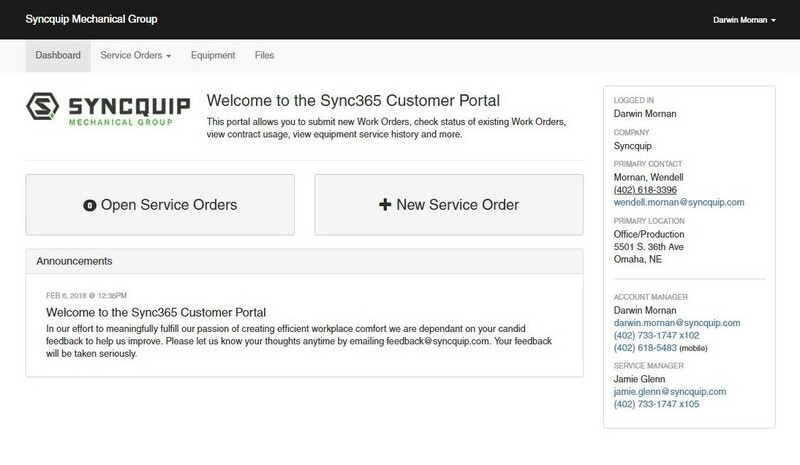 With your Sync365 maintenance agreement, you can create work orders, check status, add comment, and access equipment, contracts, and more on our convenient client portal.